Five years ago, several organizations began discussing what it would take to build a more effective and authentic voice for certified organic farmers at the national level. A cross-section of representatives from organic farming associations from the East, Midwest, Northwest, South, Upper Great Plains and mountain regions, representing approximately one-third of organic farmers nationwide, held exploratory meetings and conducted surveys with other organizations across the US. This demonstrated strong interest in forming a national alliance of organic farmers and ranchers to fill the current void. In early 2016, this group began discussions with the Rodale Institute, an organic pioneering organization, who also expressed interest in bringing organic farmers’ voice to the forefront. In 2017, the two efforts aligned as the Organic Farmers Association, sponsored by Rodale Institute. Organic Farmers Association is an independent and authentic voice for domestic certified organic farmers, focused on national policy issues that are of highest priority for certified farmers. Organic Farmers Association is also committed to building community and networking among the nation’s organic farm organizations. A stronger organizational network will support and grow organization capacity to better serve their local organic farmer-members and build higher-rates of grassroots policy engagement to participate in the national organic farmer voice. To engage certified organic farmers, organizations, and supporters of this work, Organic Farmers Association offers three types of memberships to unify the national organic farmer movement. Organic Farmers Association (OFA) achieved much in its first year, through the guidance of an appointed Steering Committee. The partnership with and sponsorship by the Rodale Institute provided much needed organizational capacity to build a functioning website and communications platform as well as membership and development support. We published two issues of New Farm Magazine, elevating national organic farm stories. We began a membership program for farmers and organizations to begin to unify our movement at the national level. We established a firm policy, under which only certified organic farmers vote on policy positions and leadership. In September 2017, Organic Farmers Association farm members elected a Policy Committee of 12 certified organic farmers and six advisory organization members to establish our policy platform. 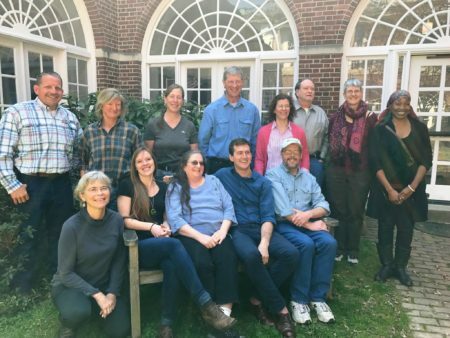 In March 2018, we elected our first Governing Council of 12 certified organic farmers and six advisory organization members to lead the organization through the next phase of growth. Both leadership committees are farmer led and farmer controlled. Both committees are regionally diverse and aim to gain diversity in farm size, commodities, gender, race, and sexual orientation to ensure an accurate representation of the nation’s organic farms. Organic Farmers Association also hired a part-time director, policy director, and membership and outreach coordinator. In 2017, the Policy Committee established policy positions and priorities for the year, which were approved by the Organic Farmers Association farm membership and have served as a guide for Farm Bill lobbying and education. The Policy Committee also invited all US certified organic farmers to submit policy priorities and positions for the membership to review and vote on this spring, which will establish Organic Farmers Association’s first policy platform. Organic Farmers Association will continue to monitor the Farm Bill progress, inform its members about how organic programs are faring through the various drafts, and continue to represent the established priorities of organic farmers through the farm bill process. Organic integrity is the bedrock of the organic label. We must have equitable and honest enforcement of the national organic standards across all commodities, states, farm sizes, and throughout international trade. • Organic Farmers Association (OFA) SUPPORTS the full and equitable enforcement of National Organic Program standards: USDA should take immediate action to bring non-complying operations and their organic certifying agents into compliance or else exclude them from the program. Congress should use its oversight authority to ensure that USDA takes the necessary actions to tighten enforcement. • OFA SUPPORTS the Organic Farmer and Consumer Protection Act (H.R.3871), which includes new Farm Bill requirements for USDA, in coordination with Customs and Border Protection, to implement enhanced procedures to track organic imports and ensure that imported products fully comply with U.S. organic standards. •OFA SUPPORTS a consistent interpretation and implementation of the pasture rule for all organic dairies. Research on organic agriculture, including soil health and alternative pest- and disease-management strategies, benefits both organic and conventional farmers. Therefore, funding for such research is essential. Unfortunately, over the past five years, while overall funding for agricultural research has grown significantly, funding for organic research has stagnated. The bipartisan Organic Agriculture Research Act (H.R.2436/S.2404) would authorize $50 million in mandatory funding annually for the Organic Agriculture Research and Extension Initiative (OREI). • OFA SUPPORTS passage of the Organic Agriculture Research Act. The National Organic Certification Cost Share Program and the Agricultural Management Assistance Act (AMA) provide organic farmers with modest reimbursements for a portion of their annual organic certification fees. • OFA STRONGLY OPPOSES any efforts that seek to dilute the authority and role of the NOSB in the overall standard-setting process, and opposes statutory changes to the delicate balance of stakeholder slot allocations for the Board membership. Certified organic farmers have needed a strong national voice for decades, and the need for this unified voice is important now more than ever. Mobilizing all the pieces to make this happen quickly and effectively is a challenging process. Leveraging the years of local and regional work of our organizational-member partners, as well as the years of movement-building work of our farmer leaders, have helped us make a great initial stride forward, establish realistic goals for each year, and continue to work to identify ways we can better serve our organic farmer and organic farm organization members. As a new voice on the national stage, we are working to build coalitions and relationships with other national organic voices so that we do not step on toes, but instead facilitate a collaborative environment to help the whole organic community succeed. Organic Farmers Association is focused on strengthening farmers’ voices and making sure organic farmers have a seat at the table. For more information, visit organicfarmersassociation.org.